As the title states, after driving around for months with turn signals that blink super fast and dealing with it ( because I have super bright LED bulbs in all 4 corners.) I finally found a fix for it! I have been searching for a while now and was originally just trying to find a heavy duty electronic to replace the stock on with. And I could not find a electronic one to replace it with. 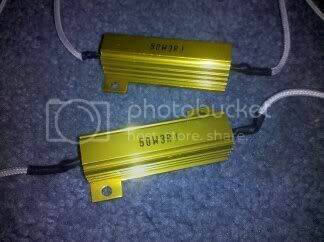 They are 3 OHM 50 watt LED Load Equalizers. I came across them and didn't know if they would work but, they were cheap enough to say what the hell and give them a shot. Installation is cake. All you do is splice them between the positive and negative wires before the bulbs. It took less than 5 min to install both of them.The nice thing about these ones is, you only need one per left and right side to take care of all 4 bulbs. So you don't have to wire one in before each bulb, and even better you only have to buy two. I ended up installing mine in the rear, but if you put them in the front they will work the same way. Diagonally will also work. Now, No more hyper flashing strobe light blinkers, all four of my turn signals blink a normal speed again! I wish I could tell you guys where I got them, but it was real late one night when I came across them and I just clicked the paypal button and bought them and didn't save the web page. All I could find right now is a USPS tracking number for them. They came in a plain box, wrapped with newspaper, no instructions, no reciept, no nothing. I gotta go to bed, but I will try to find the website and post up a link to it tomorrow. This isn't exactly top secret info... I could of helped you out years ago. Just search for "led load equalizer" on ebay and you'll get tons of results. Well Ive been searching for a while, and didn't know I needed a "load equalizer", never even knew they existed. I thought I would have to install resistors or something, but didn't know what size. Ive been asking on this site along with a bunch of other people on here and all people keep suggesting are potentiometers and electronic flashers etc. Anyways here is the link to the ones I bought, and I know they are a guaranteed fix for anyone else with this problem. They sell them on superbrightleds.com i personally just use a resistor that I matched to the resistance I read between the connectors on a good bulb. That's what I thought I had to do, but didn't quite know how to figure out how much resistance was needed. See? Makes everything easier when you ask for help. However, props to finding it on your own. I Did ask for help but everyone kept telling me to buy the WRONG things that didn't work and had to return them. That's when I went on my own and figured it out. Anyways thanks, and if you didn't know about this fix here you go, and if you already did just disregard this whole thread. I have a 2007 Honda Accord with both left and right side turn signals blinking FAST. All lights appear to be working (front and back), and this is an intermittent problem, happening more times than not. 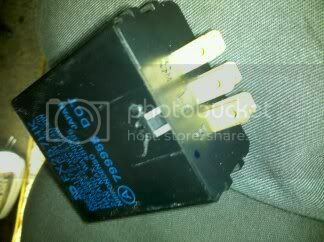 My uneducated guess is to replace bulbs OR replace the turn signal relay after having done a little research. I have not replaced any of the bulbs...all factory. I would much rather try the bulbs first, and guess I'd have to purchase all as I have no indication there's one at fault. Any suggestions, greatly appreciated. Last edited by Fogcity54; 10-30-2010 at 02:58 AM. How cheap was cheap? Just wondering because you know thats only a resistor right? not sure but just a guess the LED lights require alot less voltage to run as the regular stock OEM bulbs do, so by hooking a resistor inline would reduce the voltage and allow the bulb to flash at the same rate the stock OEM bulb would flash. How many ohms does that equalizer read on a volt/ohm meter? I bet I could find something cheaper. 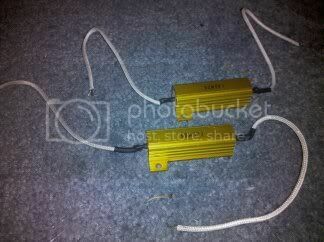 I just found it, 3 ohm resistor with a 50 watt rating. How much were they? Last edited by Rob; 10-31-2010 at 02:48 PM. They were like $4.50 each I think. 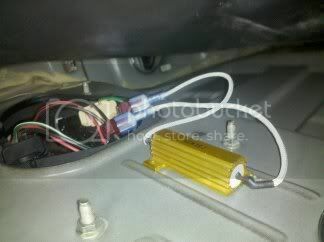 i get all of this i jst dont know where the original OE flasher is.. is it under the steering wheel? The original OE flasher is a bigger than a normal sized flasher and it is located at the top of the inner fuse box by the drivers left foot. To add these load equalizers you do Not need to touch the stock OE flasher at all. Will a 6 Ohm 50 watt work, what would be the differences?